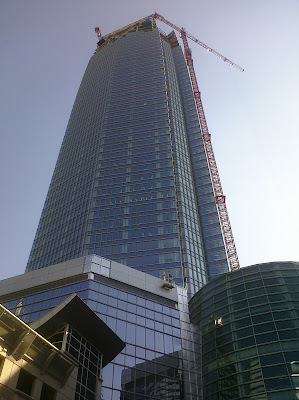 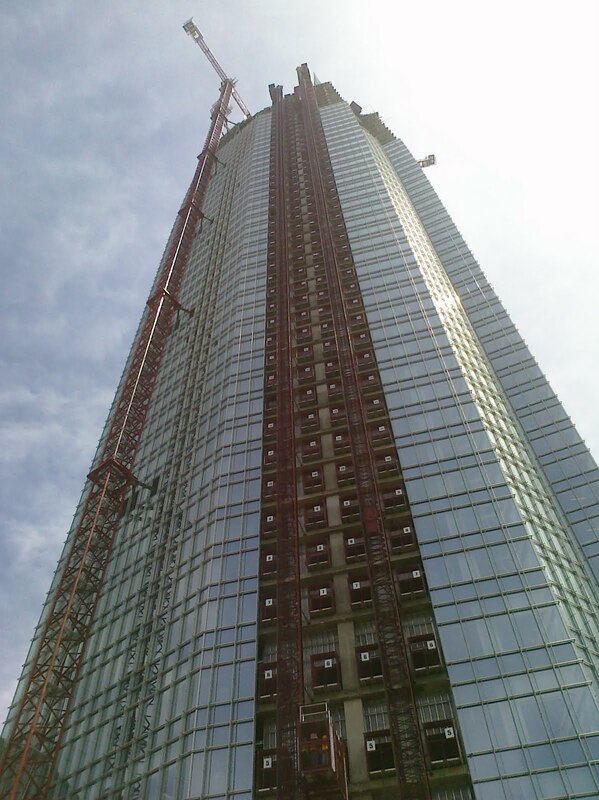 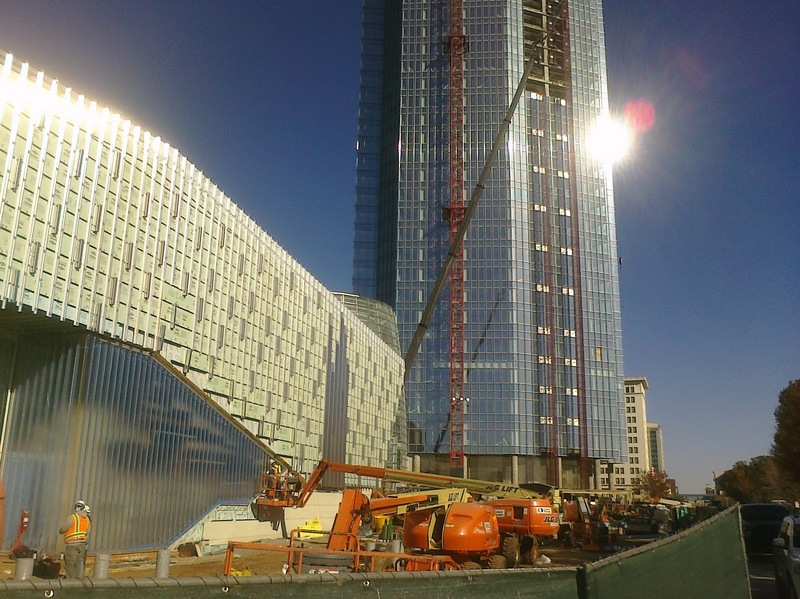 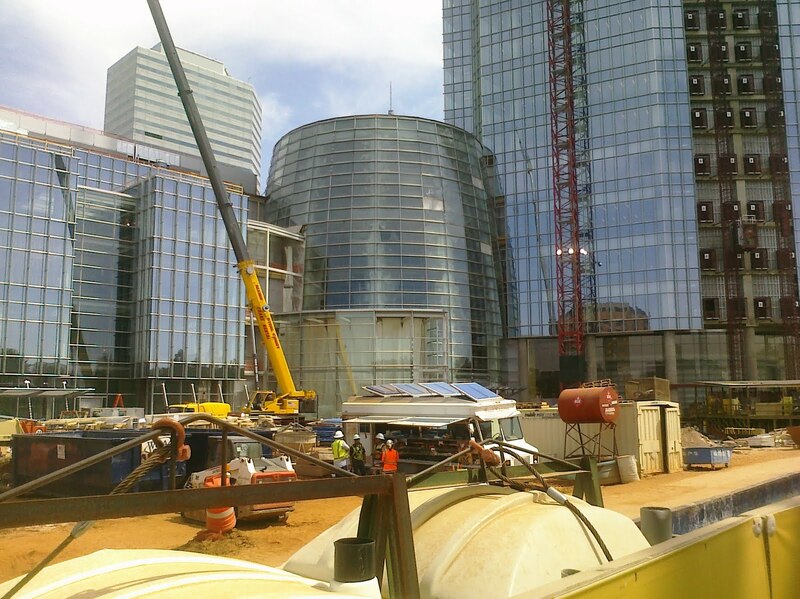 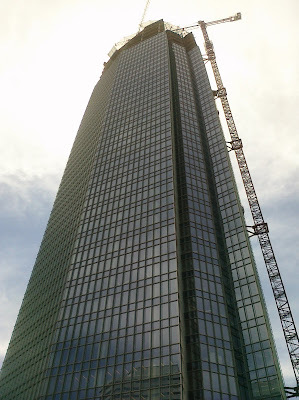 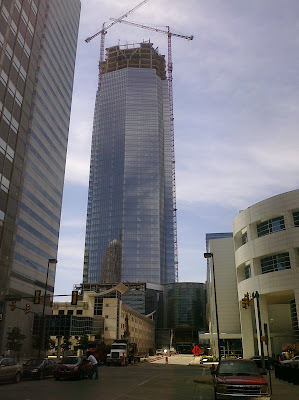 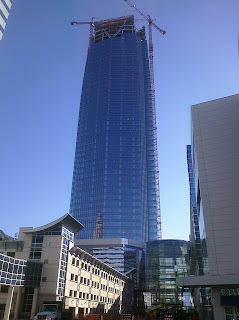 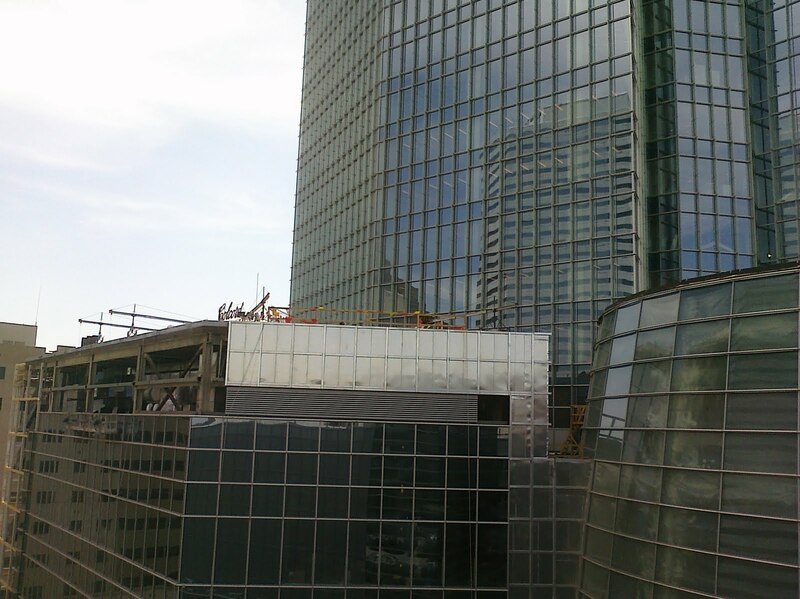 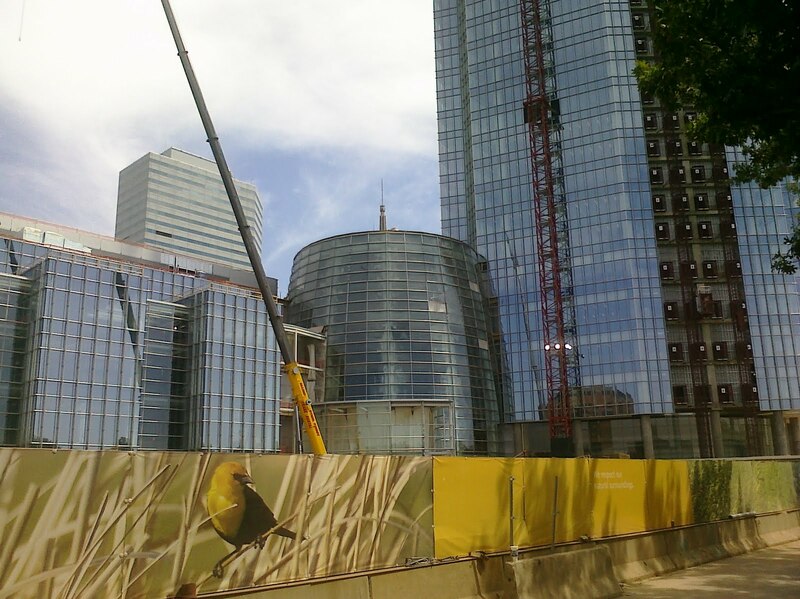 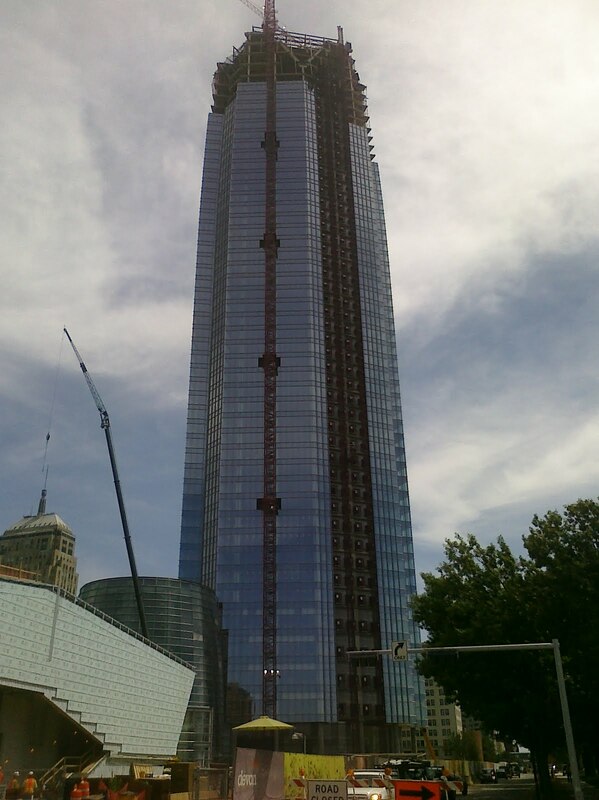 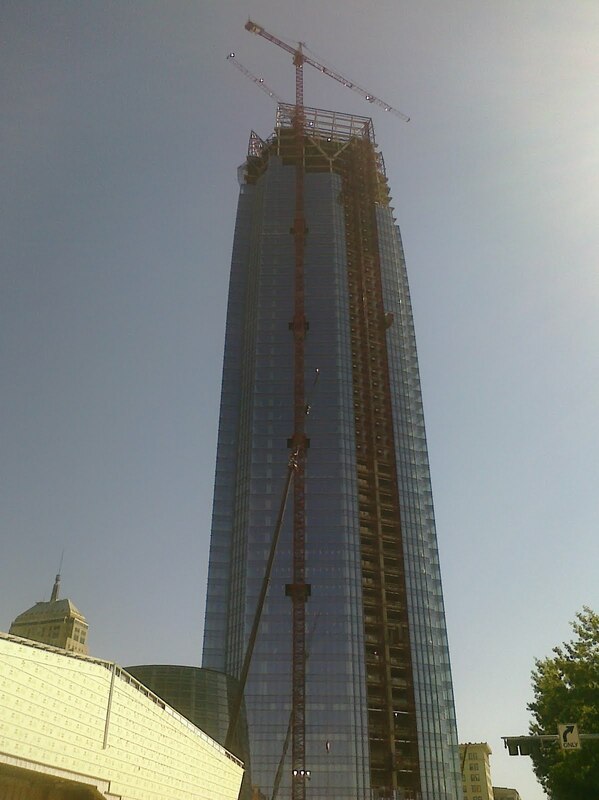 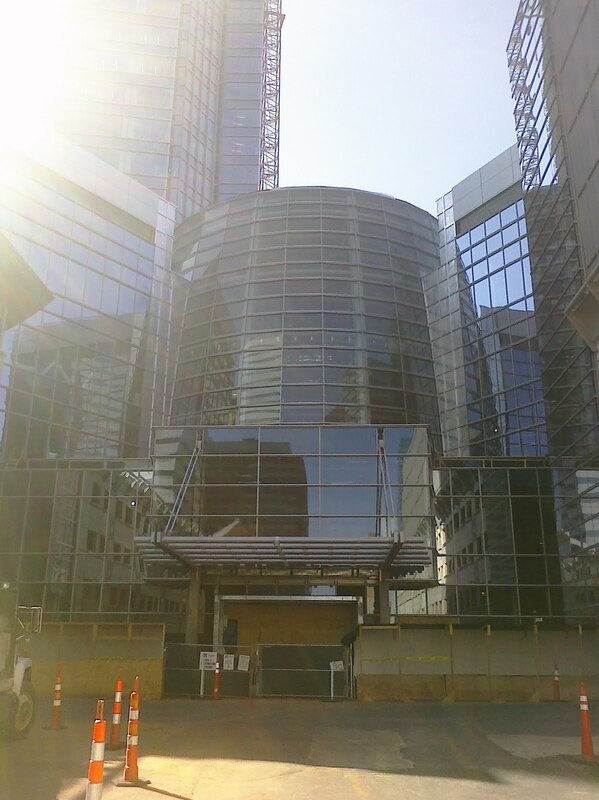 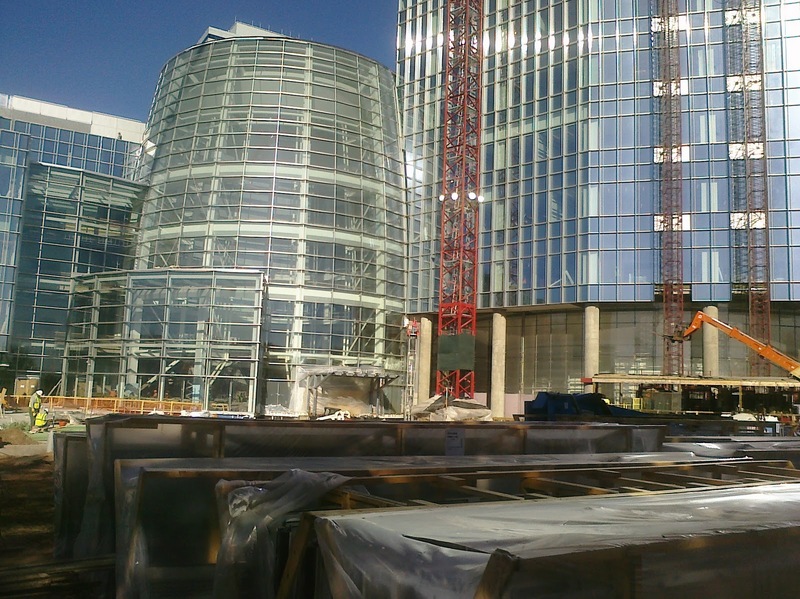 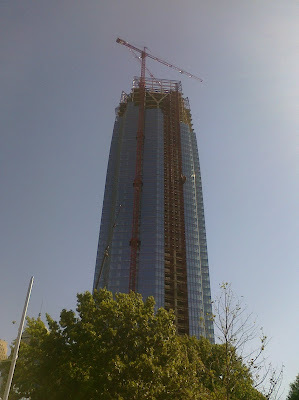 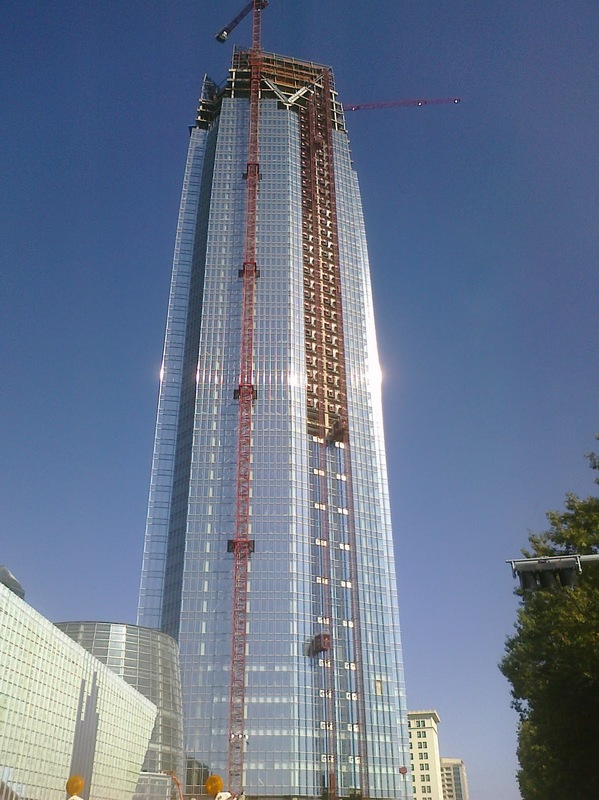 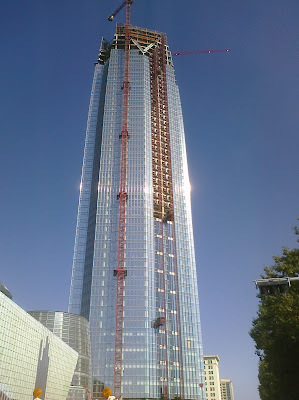 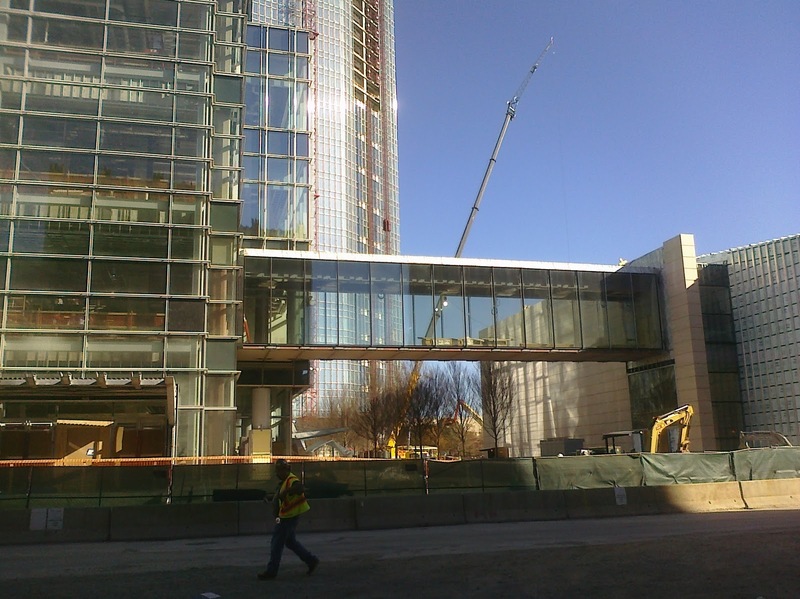 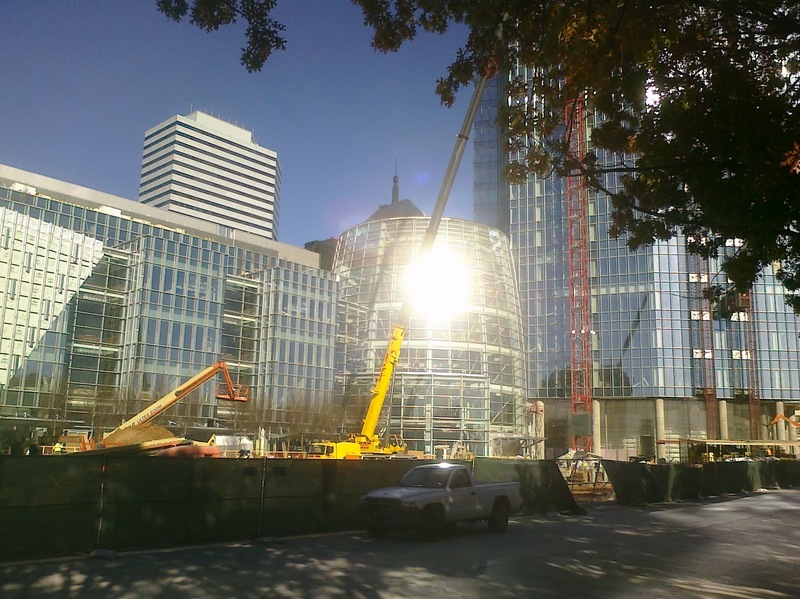 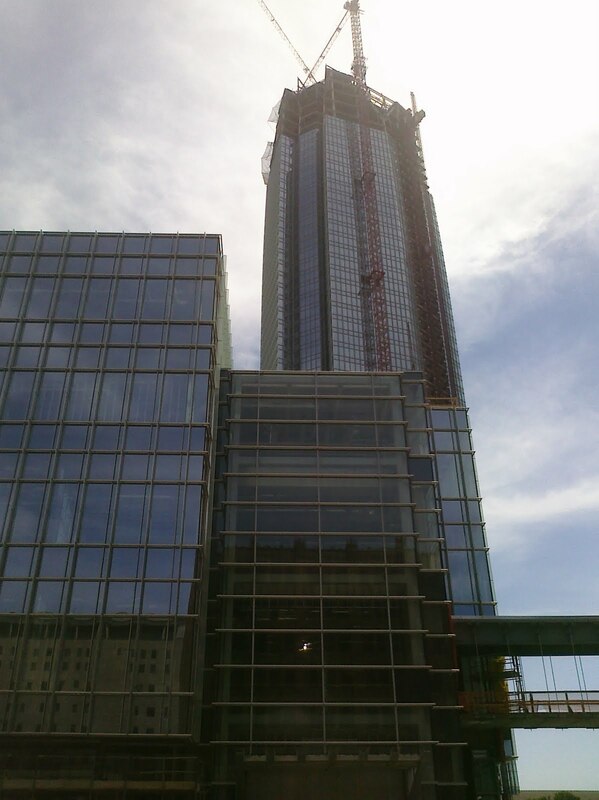 The Devon tower is nearing completion on the ground level. The street in front has been replaced for half a block. The other side will be worked on once heavy trucks are no longer needed to deliver supplies. 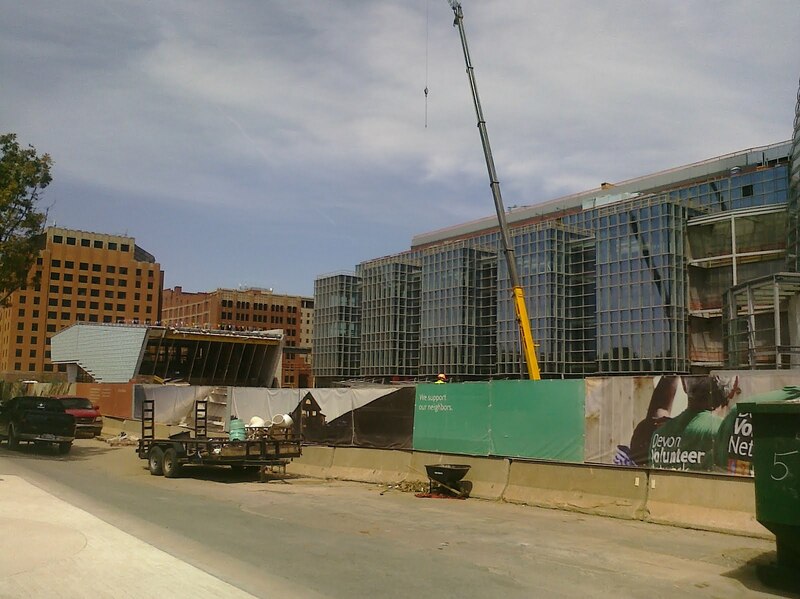 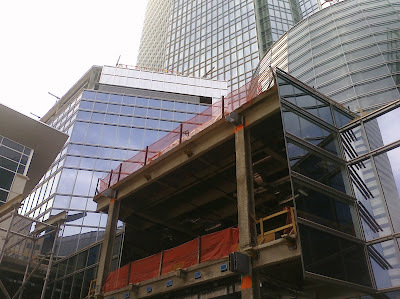 In the pictures you can that the construction elevators were being taken down. Trees have been planted in the park area outside the tower. 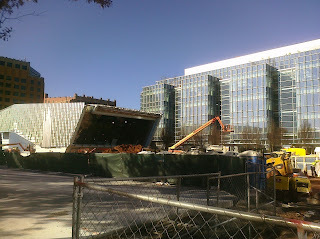 The auditorium looks to have a little ways to go before being complete. 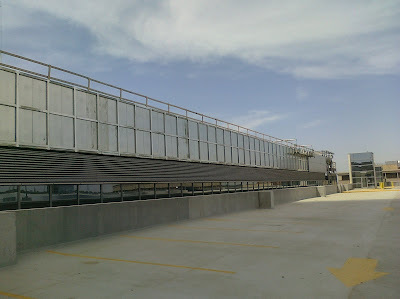 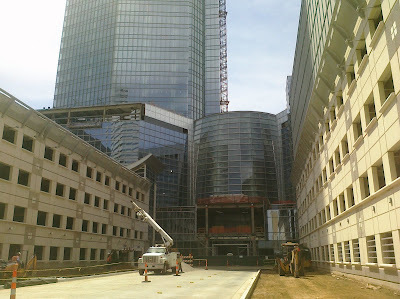 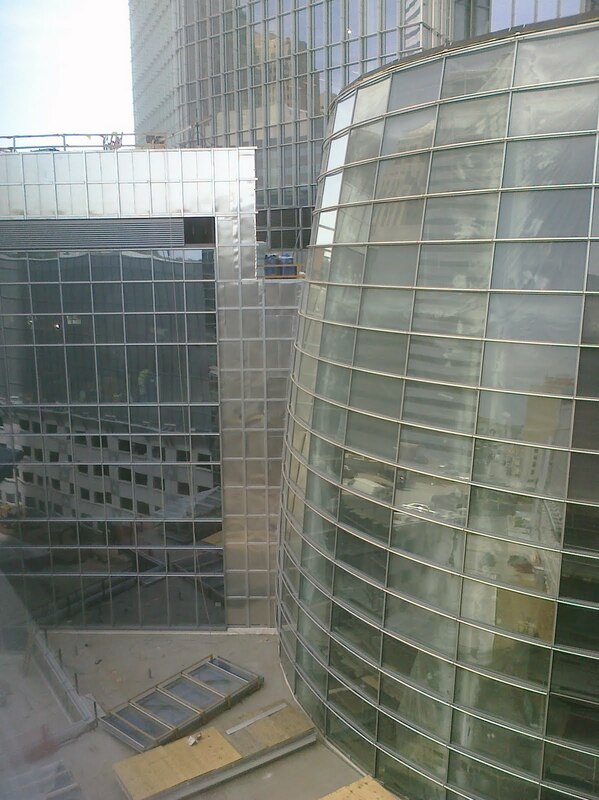 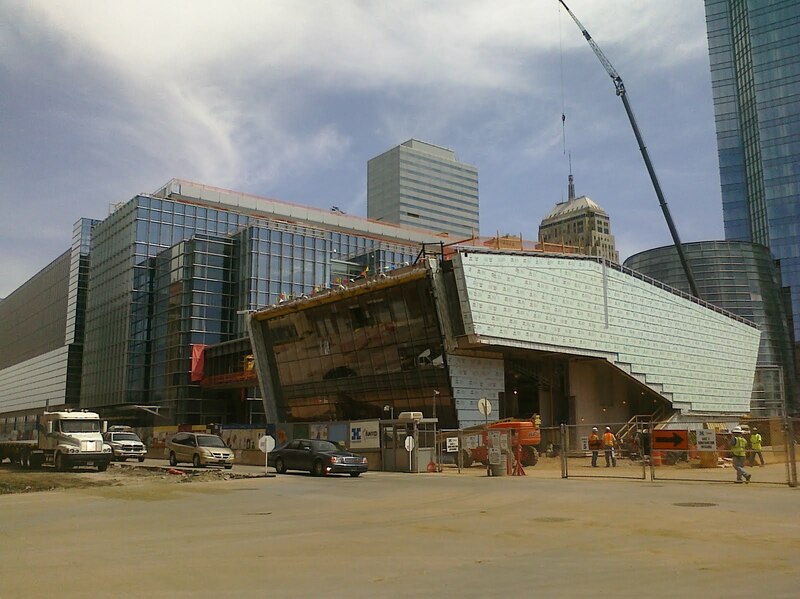 As of December 2011 NewsOK.com had a few pictures of the almost finished rotunda and areas on the 7th floor. 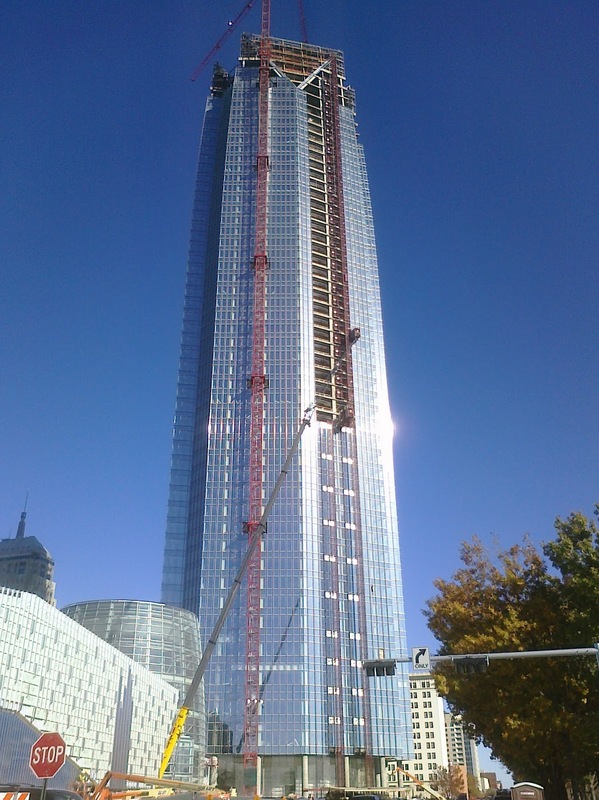 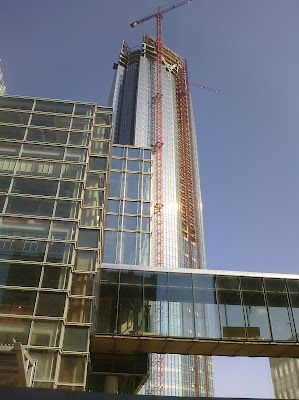 The top of the Devon Tower is starting to take shape now. 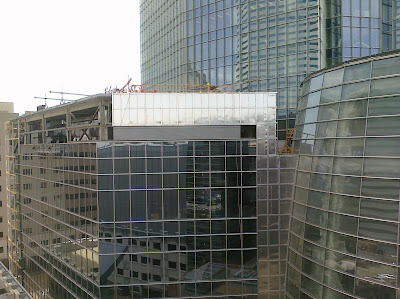 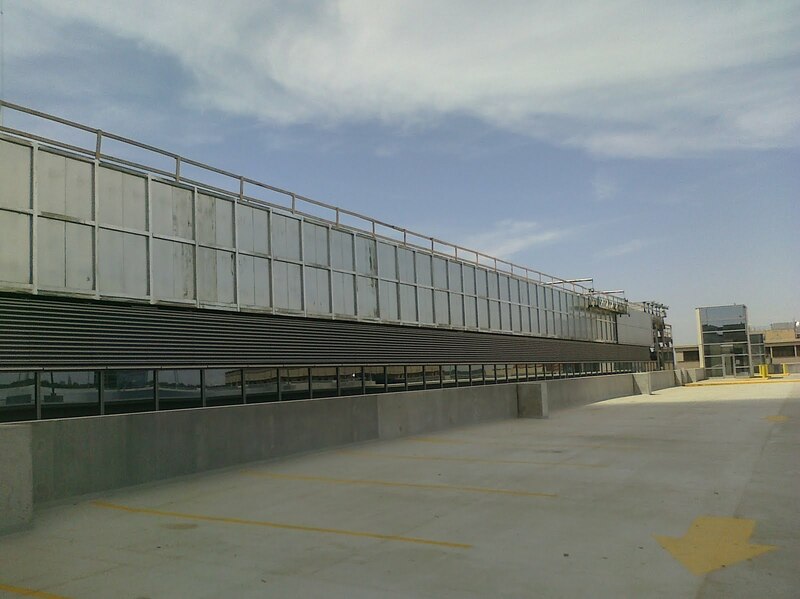 All three sides have the steel in place. 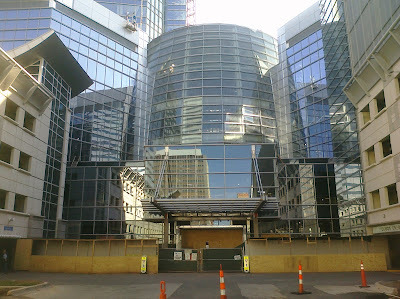 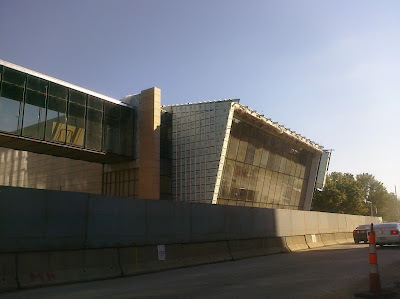 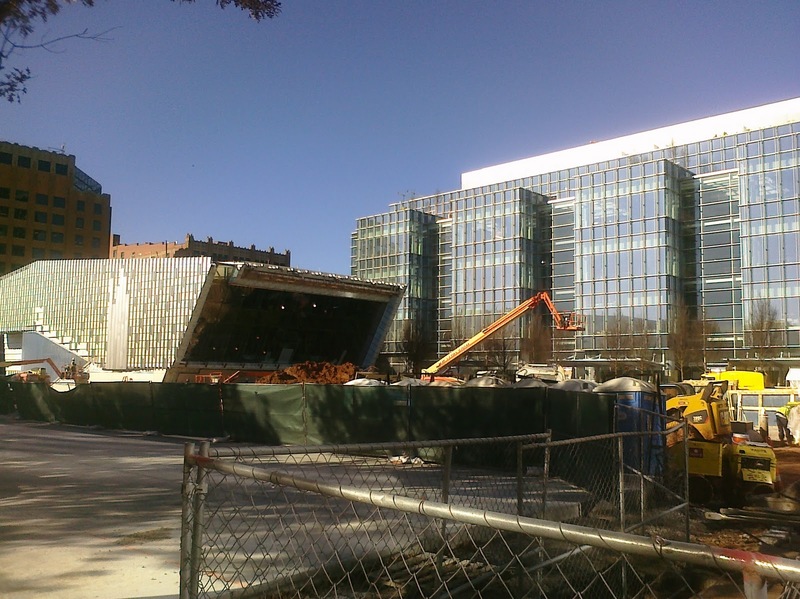 I expect them to begin installing some of the glass windows in November. The rest of the tower continues as well. 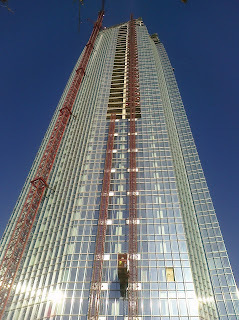 The first 10 floors or so look to be nearly complete. 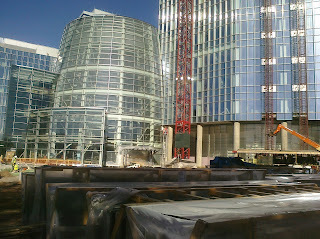 These floors are now using the lighting system that was installed rather than the temporary construction lights. 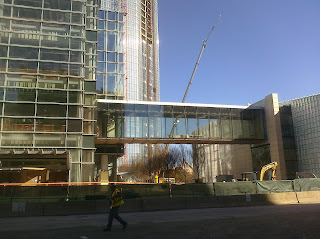 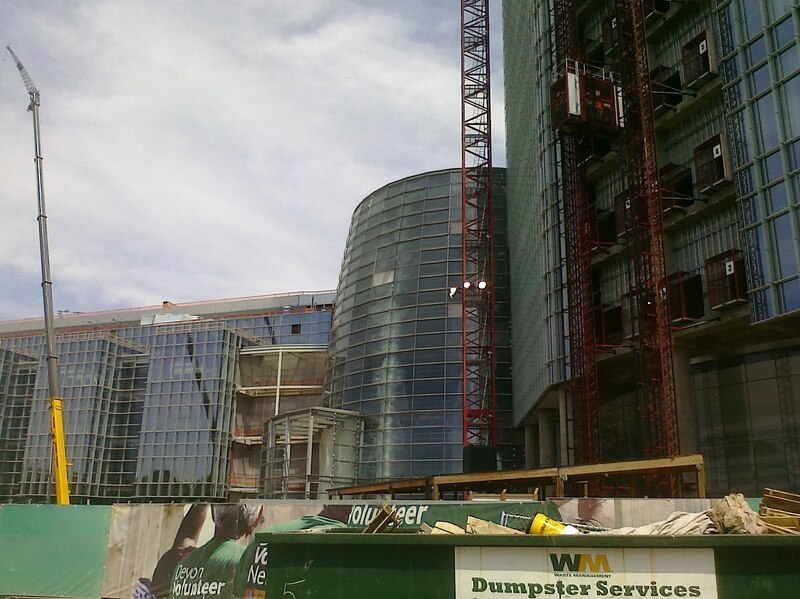 Some of the windows on the side with the construction elevators have been installed. It looks like they have installed these windows up to about the 15th floor. 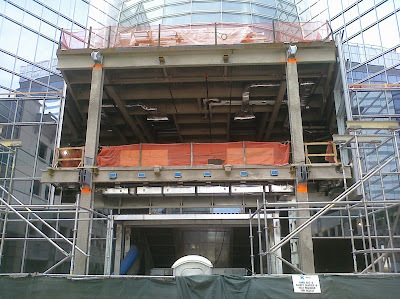 This lends me to believe that the main construction work on these floors is complete. 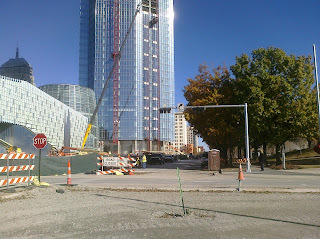 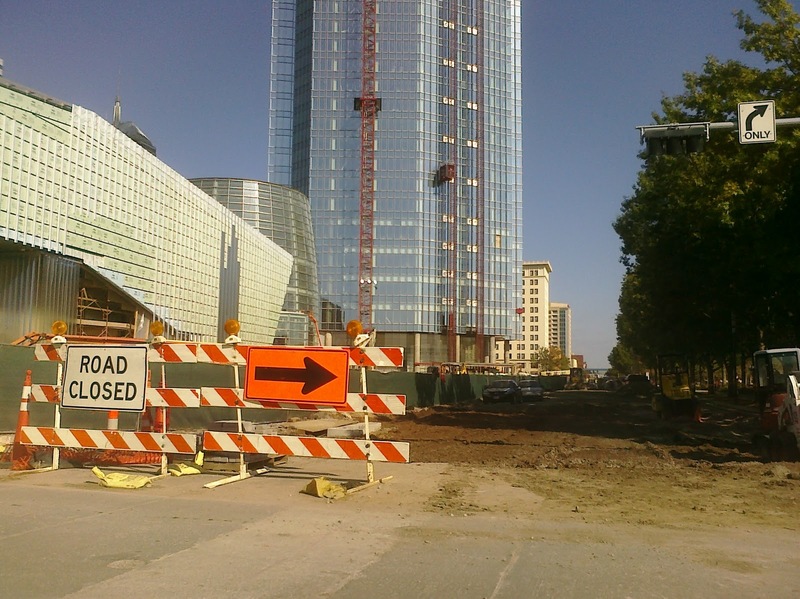 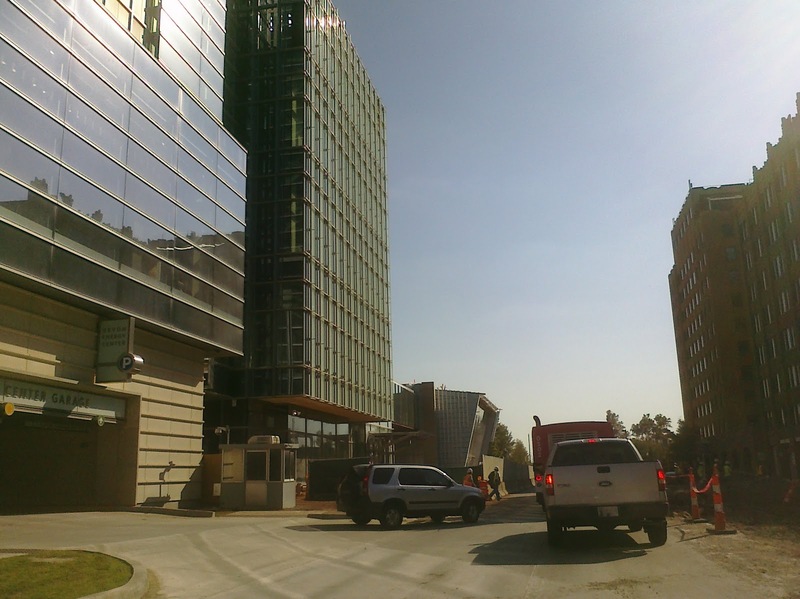 Also, the road, W Sheridan Ave, has be torn up immediately south of the Devon Tower. 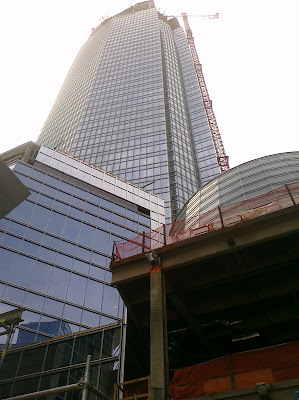 I plan to get a higher resolution camera to take pictures in November. NOTICE: All of my pictures of the Devon Tower can be used under the Creative Commons Attribution 3.0 License. 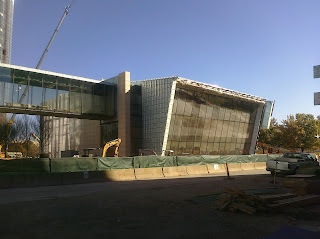 This includes use of these photos on Wikipedia. 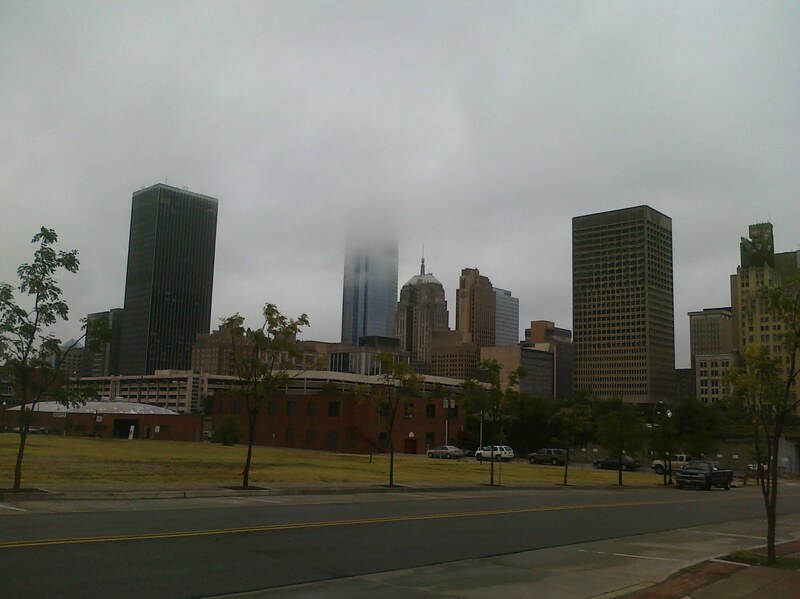 Just make sure you credit me as the original copyright owner. 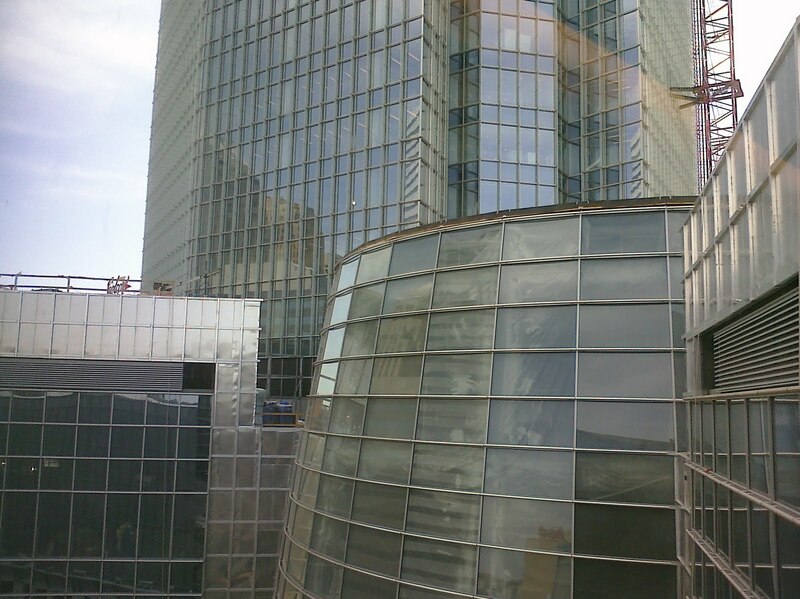 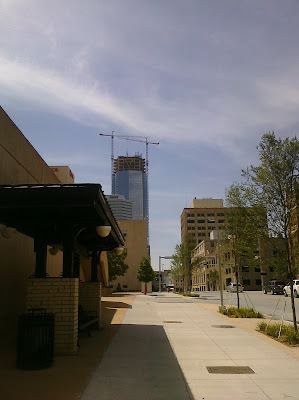 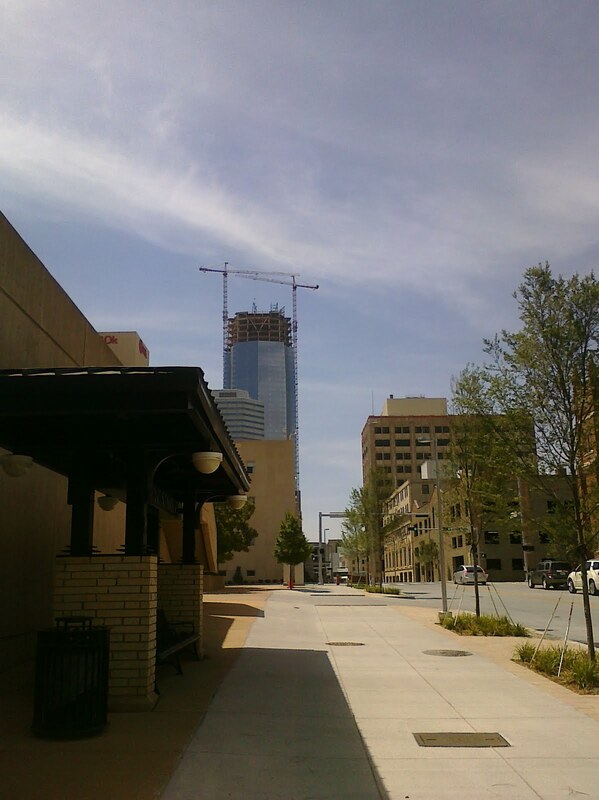 The coolest picture in this post is one of the Devon Tower looking toward the southwest on 9/16/2011. 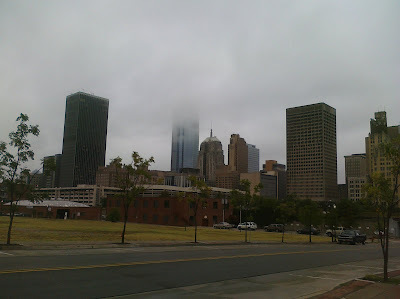 On that day there was low cloud deck and all of the other downtown buildings were below the clouds except the Devon Tower. 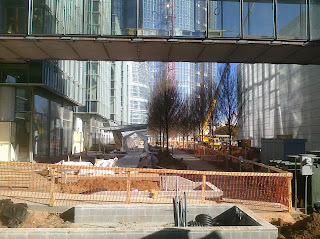 The other pictures below don't show too much different than what was seen in August. 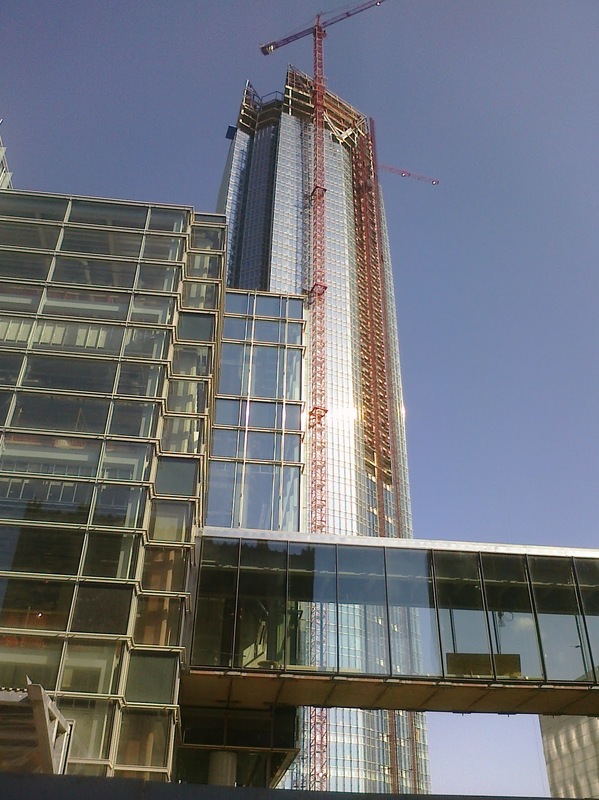 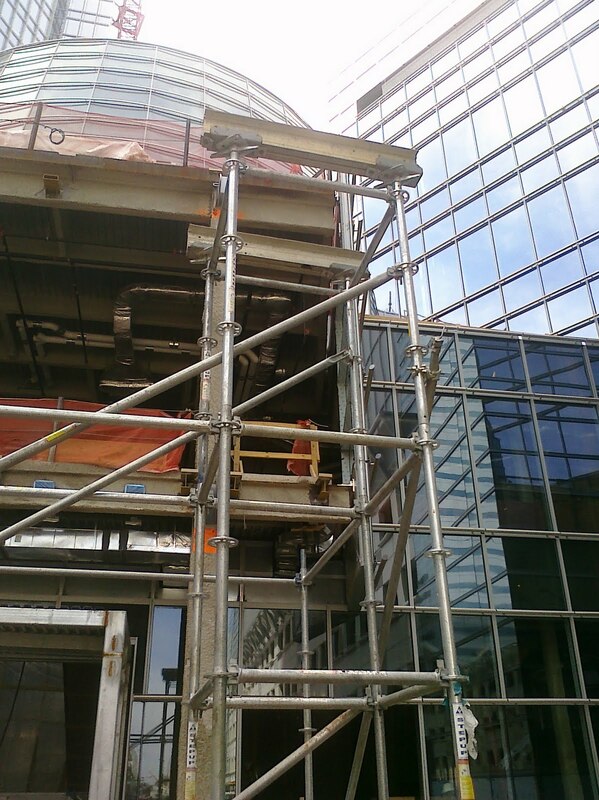 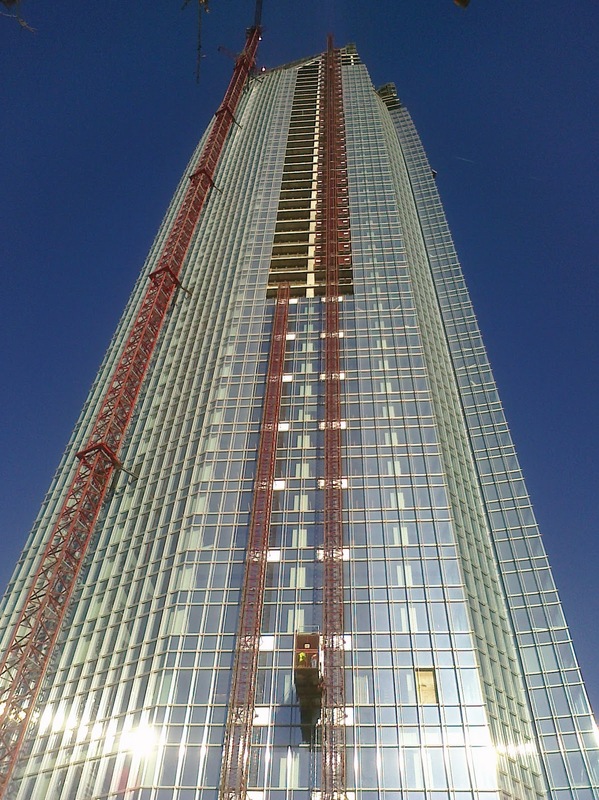 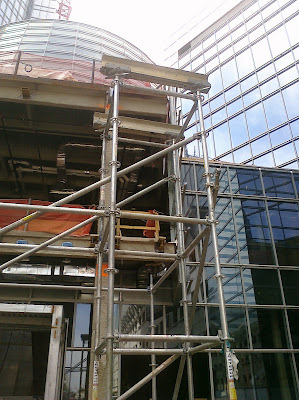 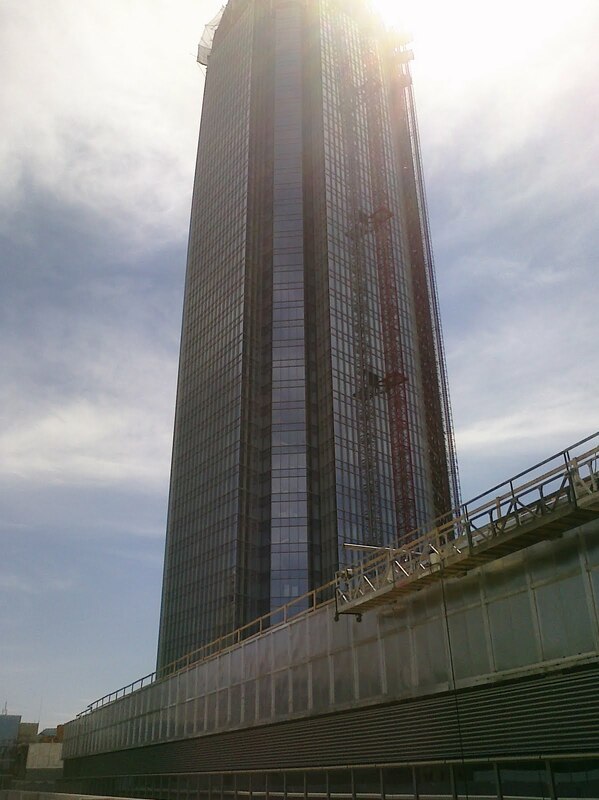 A few more floors had glass windows installed. 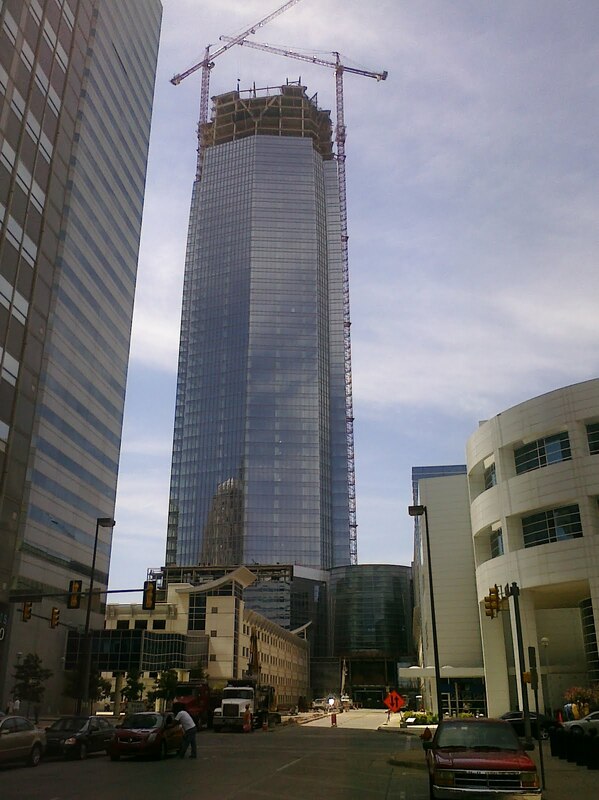 The big change is the top of the tower is starting to take shape. You can see the added beams above the finished concrete section. These beams gently slope into the center of the building as the height increases. 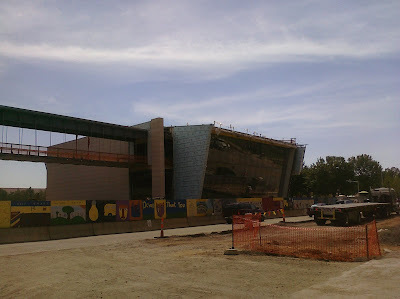 This will leave the polished look seen in the design picture in my Aug. 2011 post. 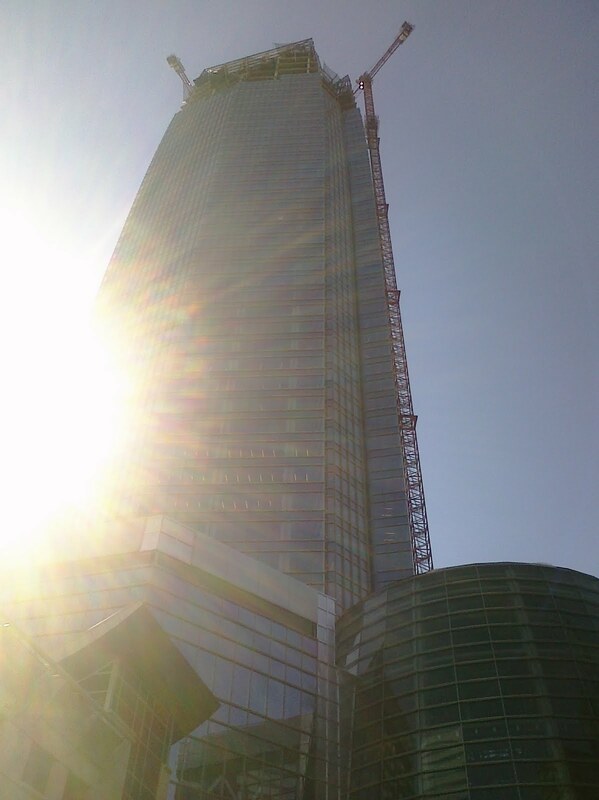 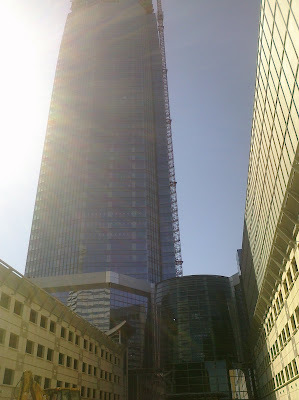 I am still not sure how the elevator situation works on the 50th floor, so maybe one day I will take a tour. 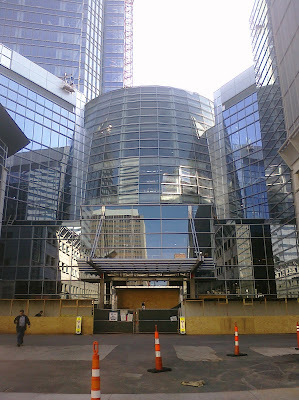 On another note... the rest of the Devon complex is looking pretty good. 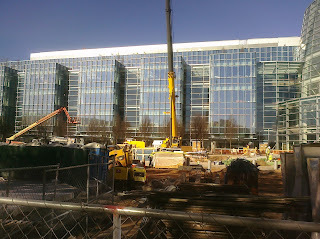 I held the camera over the fence to get some up close pictures of the future courtyard area. 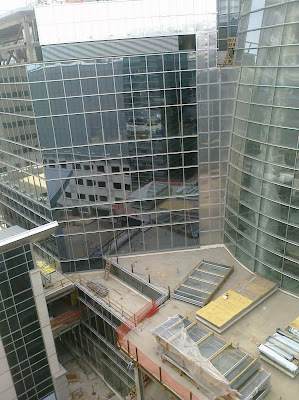 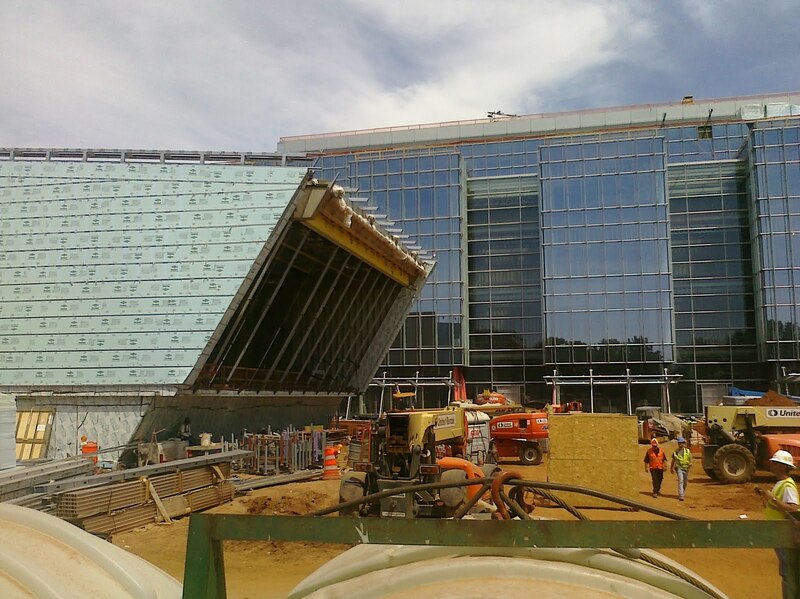 You can see that most of the glass has been installed.